A: Zoom! is an in office bleaching process that lightens discoloration of enamel and dentin. There are many causes of tooth discoloration. The most common include aging and consumption of staining substances such as coffee, tea, colas, tobacco, red wine, etc. During tooth formation, consumption of tetracycline, certain antibiotics or excessive fluoride may also cause tooth discoloration. A: Usually about 6 to 12 months depending on the patient. By following some simple post whitening care instructions, your teeth will always be lighter than they were before. To keep your teeth looking their best, we recommend flossing, brushing twice daily, and occasional touch-ups with Zoom! Take-Home gel. These are professional formula products designed specifically to keep your teeth their brightest. They are available only through your dental professional. A: The Zoom! light activated whitening gel’s active ingredient is Hydrogen Peroxide. As the Hydrogen Peroxide is broken down, oxygen enters the enamel and dentin, bleaching coloured substances while the structure of the tooth is unchanged. The Zoom! light aids in activating the hydrogen peroxide and helps it penetrate the surface of the tooth. A study has shown that use of the Zoom! lamp increases the effectiveness of the Zoom! gel by 33% or more, giving an average improvement of eight shades. 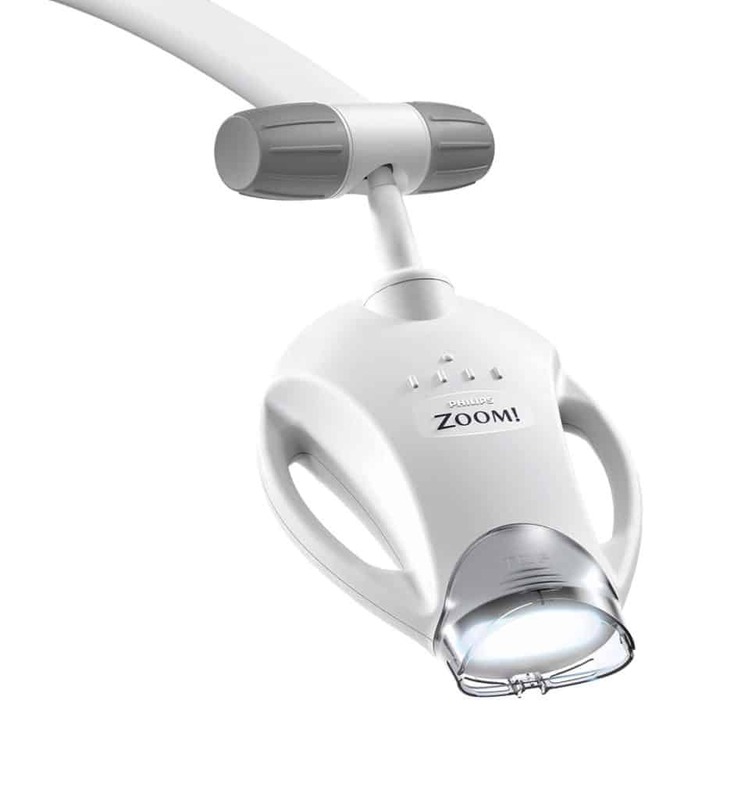 Q: What does a patient experience during the Zoom! In- Office Procedure? A: During the procedure, patients may comfortably watch television or listen to music. However individuals with a strong gag reflex or anxiety may have difficulty undergoing the entire procedure. A: The Zoom! procedure requires that all soft tissue in and around the mouth be protected. 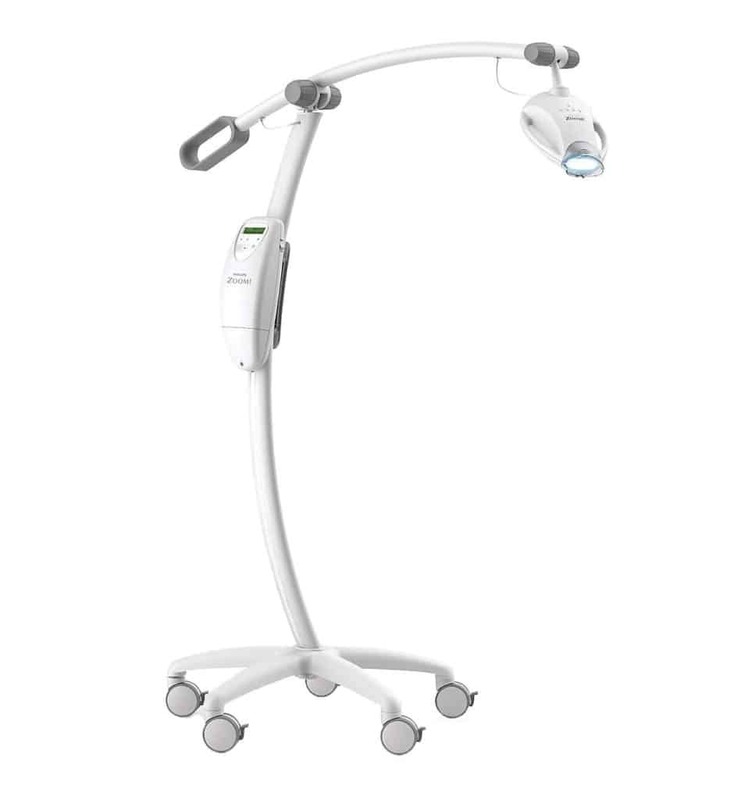 The clinician is required to monitor the procedure to insure any exposed skin or tissue is isolated and protected. Protective eyewear is required during the procedure. Light sensitive individuals should not undergo theZoom! in office procedure. Anyone who is not eligible for Zoom! Chairside Whitening for these reasons may be an excellent candidate for Take-Home whitening. A: Sensitivity during the treatment may occur with some patients. The Zoom! light generates minimal heat which is the usual source of discomfort. Minor tingling sensations or ‘zingers’ may be experienced immediately after the procedure, but always dissipate.